Jason Schappert, a flight instructor and founder of the online ground school MzeroA.com, is producing a documentary feature film about pilots who haven’t flown in years taking to the skies again called “Flying Again,” and has turned to crowd funding giant KickStarter to raise funds. The short period fund raising project started this Monday and has already raised half their initial funding goal of $20,000. 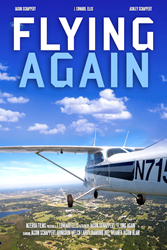 “Flying Again is a film that any aviation enthusiast would enjoy,” said Schappert. The film crew is seeking funding to pay for the computing power needed to edit the 4k footage, and to pay for gear rentals so they can film with professional cinema cameras and stabilization so they can film from a second aircraft while completing training of the documentary subjects. Schappert is the author of eight industry best selling books, and is writing a companion book called “Help! I haven’t flown in years!” to help guide rusty pilots back into the sky. Sponsorship rewards include a three year membership to their online ground school, a $5,200 value for a $750 sponsorship, or a day of flying with Schappert to beautiful Cedar Key, Florida, an island with a 2,000 foot water surrounded runway. “We want to wow the viewers with beautiful aerial footage, but the film is about realizing dreams,” said John Ellis, the director of the film. “The emotional core of the film is the pilots, and their stories. Each of them has stopped flying for some reason. Life, money, family can all get in the way. But each of them dreamed of being at the controls every time they saw a plane fly overhead,” Ellis said. To learn more about this film project visit https://www.kickstarter.com/projects/mzeroa/flying-again-a-pilots-journey-back-to-proficiency or to learn more about their online ground school visit MzeroA.com.